It is sometimes difficult to prove who is at fault for slip and fall accidents. Thousands of people each year are injured, many seriously, from slipping and falling on a floor, stairs, or other surfaces that have become slick or dangerous. A slip and fall accident can happen anywhere and to anyone, and change your life forever. They can also be quite painful, potentially producing considerable amount of money in medical bills and lost wages. Slip and falls are the most common variety of accidental injuries, aside from auto accidents, that a law firm like Grenier Law would litigate. So let’s look at some of the most common types of slip and falls (source: SpinalCord.com), that can range from minor to severe, and even result in death. Even an apparently minor head injury is a medical emergency. If you fall and hit your head—especially if there is swelling, bleeding, or even a brief loss of consciousness—you need immediate medical care. Minor concussions usually clear up on their own, but more serious traumatic brain injuries (TBI) can permanently alter your ability to function. Head injuries cannot be diagnosed based on symptoms alone, and some very serious head injuries produce only minimal symptoms at first. No matter how inconvenient it is or how “fine” you feel, your first stop after a head injury should be to your doctor. This can also increase your odds of a successful lawsuit, since a medical visit provides firm documentation of your injury. Slip and falls that produce cuts and abrasions can look quite severe, but the injuries are often less extensive than other sorts of slip and falls. Leg and arm abrasions are common, as are wounds to the head and hips. In most cases, these injuries only require superficial treatment, and perhaps some stitches. But if the impact of the fall is sufficiently hefty, cuts and abrasions may rest atop more serious injuries, such as concussions and broken bones. Spinal cord injuries occur when the spinal cord is either severed or compressed. These injuries are almost always life-threatening, and demand immediate medical care, as well as ongoing treatment. They are among the most costly injuries to treat, costing up to a million dollars or more in the first year after the spinal injury. Generally speaking, the higher up in the spinal cord the injury is located, the more extensive the damage will be. High cervical spinal cord injuries often produce quadriplegia — full paralysis — while injuries lower in the spinal cord may only produce paraplegia — paralysis of the lower limbs; or potentially even milder symptoms. Broken bones are painful, scary, and can range from only minor fractures to severe breaks demanding numerous surgeries. The tissue surrounding broken bones may also be damaged, necessitating long-term therapy to prevent chronic pain and neuromuscular dysfunction. Though a popular myth suggests that a bone is not broken if you can move the joint, it is impossible to diagnose a broken bone without an X-ray. If you take a sudden, sharp fall and feel concentrated pain in a bone or joint, go to an emergency room. Because broken bones can cause extensive bleeding, and because the swelling that occurs over the first 12 hours can make the break more difficult to treat, prompt medical intervention is vital for your recovery. If you or someone you know has sustained a slip and fall injury as a result of someone else’s negligence, you should contact Grenier Law as soon as possible as slip and fall injuries have statutes of limitations. Once you retain Grenier Law, Monick Grenier will look into the circumstances of your slip and fall accident and fully investigate the issue of liability. 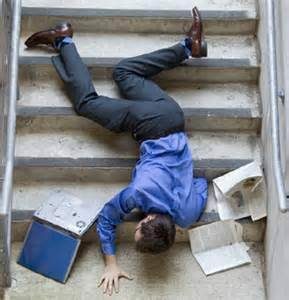 For example, factors that could be relevant to a slip & fall accident on a wet staircase, could include whether anything was done to prevent the stairs from being slippery (any non-slip floor treatment), whether there was adequate lighting, whether there was a breach of the building code and whether there was a system of inspection. Monick Grenier will build a personal injury claim by possibly retaining experts, getting medical reports and conducting on-site investigations to better understand the details that would help successfully represent you as the injured party. If you have been injured, please contact Grenier Law today. Monick Grenier offers a FREE Consultation.